One hundred years on from the Russian Revolution, Imogen Robertson reviews a new Royal Academy exhibition that explores the period through its art. Want to find yourself in a crowd surrounded by slogans demanding revolution or exhorting devotion to a new strong man leader? Want that and a gift shop? Then leave twitter and the American Embassy alone and get along to the Royal Academy of Art at some point between now and 17 April to see Revolution: Russian Art 1917–1932. The Academy have brought together a remarkable collection of paintings, photographs, films and artefacts, many from the state museums in Russia and others from private collections, to demonstrate the tumult which gripped the Russian art world in the wake of the revolution, and the effect in a crowded gallery is somewhat dizzying. The exhibition is organised into a number of rooms, some of which focus on an idea such as ‘Man and Machine’, and some on individual artists. 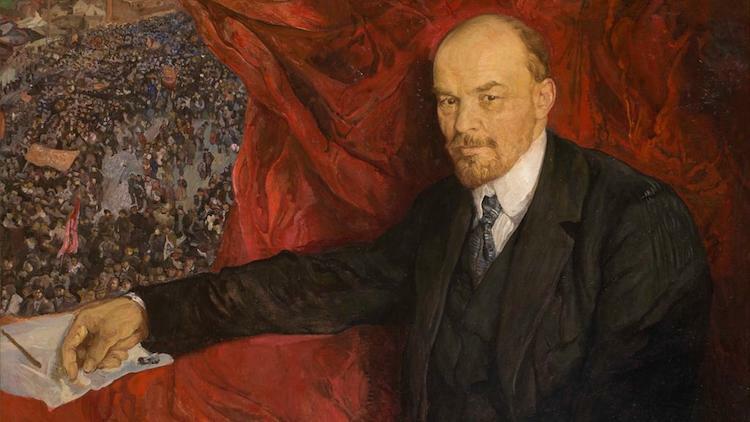 You start by coming face to face with Lenin in a pair of monumental realist portraits by Isaac Brodsky. In one Lenin, against a scarlet backdrop, observes the viewer calmly, his right hand on a pile of papers, and above his right arm as if through a window, we see a mass demonstration in progress. It has an ironic or chilling echo of those standard 18th century portraits of the landowner showing off his estate. The second is more intimate, Lenin bent over his papers while a draped armchair invites the viewer to join him. Sharing the space is Brodsky’s 3/4 length realist portrait of Stalin, and another by Gregory Rublev, a naive bright orange shout of experimentation. Perhaps it’s a tall order to ask for coherence in an exhibition which describes a epoch of fundamental change, or perhaps it is by design that the clash of aesthetics in the exhibition creates a certain wooziness in the viewer. Do not be put off; the exhibition leads you through the issues and contextualises figures such as Malevich and Kandinsky as well as showcasing less well known artists such as Pavel Filanov. The latter, a key figure of Russian Modernism, is new to me and I was seduced and amazed by his closely worked semi-abstracts, rich with folkloric touches, which have the texture of tapestry. Many artists embraced the message of revolution with ecstatic, if often short-lived fervour and the bold inventiveness they put into service of the revolutionary ideals is on vivid display. The story-telling stencil work of Vladimir Mayakovsky swipes in scything strokes across the academy walls, and the photographic portrait of him by Alexander Rodchenko captures the passion, somewhere between rage and ecstasy, that I recognise from his poetry. He killed himself in 1930, just before Soviet Realism became the only acceptable form of artistic expression. The photographs and films on display are easy to miss among all the colour and contrast of the paintings and stencils, but do pause and look. The portraits of the artists and writers are exceptional and the techniques developed by Eisenstein and his followers revolutionised cinema. 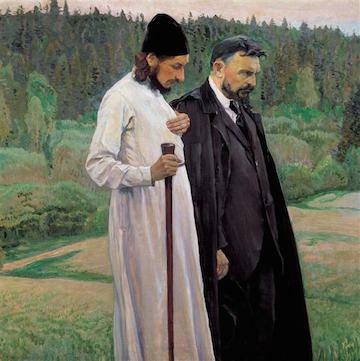 I also walked into (like meeting an old friend from home while crossing the road in Piccadilly Circus), Mikhail Nesterov’s stunning double portrait ‘The Philosophers’, which I wrote about coincidently on The History Girls last month in a more personal post about Russia and revolution. It is part of another room, another theme, this time the attempt of artists to hold onto something of Old Russia in the modern age, and it has a seriousness yet visionary aspect to it caught in the scale, the lightness of some of the brushwork. My only complaint, and it seems churlish given the range of excellent work brought over from the exhibition, is that it was the only painting I could find by Nesterov on display. Though I hope no one asks me what I would have left out to make room for him. Well, of course I’d have left out the Malevich, but I appreciate we’re not picking for my personal art gallery. Aside from the art, photographs, films, the exhibition includes scarfs printed with portraits and slogans, porcelain and lacquerwork of artists used to working in the folk traditions of icons and folktale readapting their visual vernacular for revolutionary ends. One plate snagged on my mind with uncomfortably contemporary hooks. The centre of the plate shows sickle, red star and sheaf of corn while around the edge is written ‘Those who aren’t with us are against us.’ I said to my husband if they sold reproductions in the gift shop we should get one. It was a dark joke, but a joke nonetheless, but I wished it unsaid when we reached the final room of this remarkable exhibition. Playing in a room within the room is a film made up exclusively of the official police photographs of some of the many thousands of men and women who were caught up for not ‘being with us’, or not sufficiently so. Each mugshot (full face and profile) appears on screen for a few seconds, just long enough to look at the person and read the text giving their name, profession, date of imprisonment and release or execution. Orientalist, Librarian, Music teacher, translator, work supervisor, secretary… Occasionally one spots a name last seen on a label in the main body of the exhibition. It is not an artwork, but is the place I stayed longest. All that hope, energy, intoxication, a violent endeavour, and then all those names. 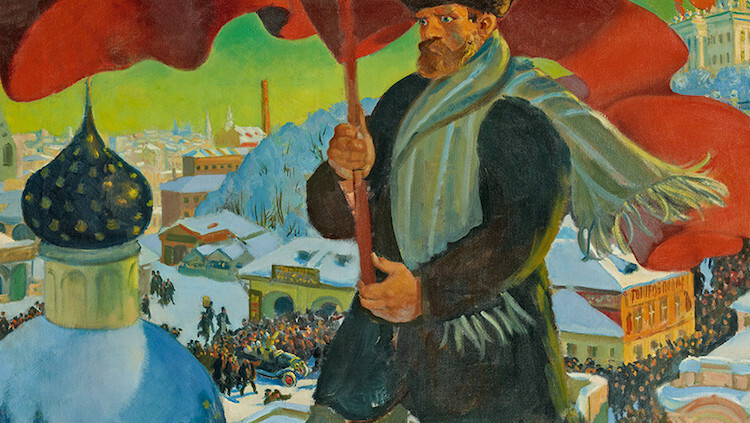 Revolution: Russian Art 1917–1932 runs until 17 April 2017. Imogen Robertson writes historical novels and is Chair of the Historical Writer’s Association. Her latest book, Theft of Life, is out now.